Pakistan and the world are reeling this week from the horror of a young teenager, Malala Yousufzai, being shot in the head and neck outside of her school. This tragedy, as often happens, is bringing people together. Reeves reported Oct. 15 that, “Every now and then, something happens in Pakistan that really strikes a nerve. 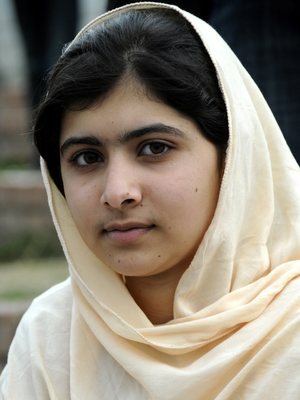 The shooting of Malala Yousafzai is widely seen as one such moment. Pakistanis held prayers across the land.” They also protested the shooting. “Even little kids are rallying to Malala’s cause,” Reeves said. Our American ethical sensibilities join with Pakistani ethical sensibilities on this issue. This simply is a great wrong. But this is not all of the story. While Pakistanis condemn the Taliban violence, some are asking what the difference is between this act of terrorism and the U.S. drone attacks in their country. There is the same result from both — innocent lives are being lost. We American Christians are confronted by this reality, as well. We do not like to think of our drone attacks as taking innocent lives. While we kill “bad guys,” we also apparently are killing “good guys,” as well. Because of our views regarding the sanctity of life, we cannot easily dismiss such circumstances. War is terrible and messy. It presents difficult realities for those of us who love others as ourselves. Christian “just war” principles sets forth that “every effort must be made to protect noncombatants from harm,” said Van Christian, pastor of First Baptist Church in Comanche, in a column on just war last year in the Baptist Standard. That is a good word to remember. U.S. drone attacks have been very helpful in our war on terrorism, but we view such national policies through the “eyes” of faith in Christ. And, as with other matters, the realities of life confront us in our faith, and we often are discomforted. We grieve over Malala and pray for her full recovery. Likewise, we grieve over all of the innocents who are harmed in war and pray for an end to the fighting. The recent violence in the Middle East is a bit hard for many of us in America to understand. Murder, violence, and destruction because of one terribly made and terribly misguided Internet video? It doesn’t make sense. 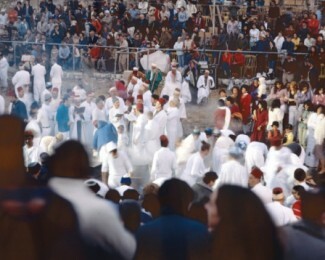 It would be easy to b e dismissive of the Arab and Muslim worlds, but that would not be helpful. They are people created in the image of God but marred by sin, just as we are in the West and in our Christian churches. Our sins may at times be different, but we do share a common need for the grace and guidance of God. It is good in such circumstances of cultural difference to listen to others as much as possible. Marwan Muasher spoke on the topic, “A View from the Arab World,” on Sept. 12, the day after the murder of U.S. Ambassador Chris Stevens in Libya. Muasher is a vice president with the Carnegie Endowment and previously served as foreign minister (2002–2004) and deputy prime minister (2004–2005) of Jordan. We, in the West, called it Spring. It looked like the arrival of a new season of life and beauty. Now, of course, we see things more clearly. “The romantic period I guess is over now and people now realize that this is not the case. That is not, though, a defense of the status quo—far from it—because I think the status quo in the Arab world, as I said, was simply not sustainable. But it may be an injection of reality into making the point that transformational processes need time, and that if one is to judge what is going on in the Middle East through the prism of two years, then all of us will get heartaches with the developments that are taking place, including the tragic developments yesterday. “But if one is to take a longer-term view and understand, as I believe, that this is a battle in the Arab world that should have been waged decades ago but has not been waged and is being waged today, then one has to accept that battles are going to result in ups and downs, in challenges that will not move the democratization process along a linear line all the time. This is what we are seeing today. “The Arab world, while it succeeded to get rid of colonial rule less than 100 years ago, did not succeed at developing pluralistic societies, and the Arab world was left after independence with only two forces, which to this day still exist: either Arab governments that have ruled without any system of checks and balances and have come up with all kind of excuses for not developing such a system; or an Islamic opposition that has used the mosque for political purposes, that has promised the moon to people without having to prove their promises because they were artificially kept out by Arab governments of the system. These words are helpful, I think. They can help us understand that the Arab world is struggling through a very difficult time as they seek to find their way forward. We Christians should pray for these brothers and sisters. We all fall within Christ’s love. This seems intuitively true. Just look at the relationship between the United States and Saudi Arabia. If it was for the great oil trade, the U.S. most assuredly would have squashed the Saudi royal family by now because of its anti-western activities through the decades. But our need for oil keeps us from the battlefield there. Of course, trade can also lead to war — look at Iraq. If not for oil, we almost certainly would not have invaded Iraq. Thinking back to World War II, it’s my understanding that the U.S. was a thorn in the side of Japan’s oil trade, and that led to the attack on Pearl Harbor. So, is Kaplan right? I think it would be better said that good trade relations can mitigate against disagreements festering into war. Bad trade relations can actually make it more likely. 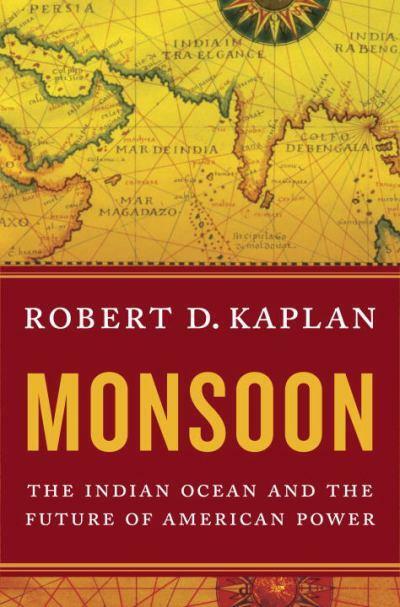 Kaplan’s book, of course, looks at one geographic region and the importance of trade. If the point I just made about the connection of good and bad trade relations to war is correct, then it’s important to understand this region as we move forward. The world doesn’t need a war between the U.S. and China and any other powerful nations, but bad trading relations can lead in that direction. Kaplan helps us in that understanding. In America, we need to grasp the truth of Kaplan’s statement, “China is not necessarily America’s adversary.” China has, in many cases, different values from the West, but this giant of nations is changing, becoming more western economically and in other ways. For one thing, seeing China only as a potential adversary may blind us to some of the other issues Kaplan talked about in that last paragraph. And we need to remember, American debt and consumer buying are what have made China strong. “Great-power politics will go on as they always have, with the American and Chinese navies quietly competing and jockeying for position in the First Island Chain, and India and China competing for sea routes and influence. But these activities will be framed more and more by a global civilization, the product of a new bourgeoisie that in and of itself constitutes a moral force with which to be reckoned. My view of the world has centered upon the West — Europe joined to North America by the Atlantic Ocean. World War II and the importance of Japan and China brought the Pacific Ocean more into the American consciousness. 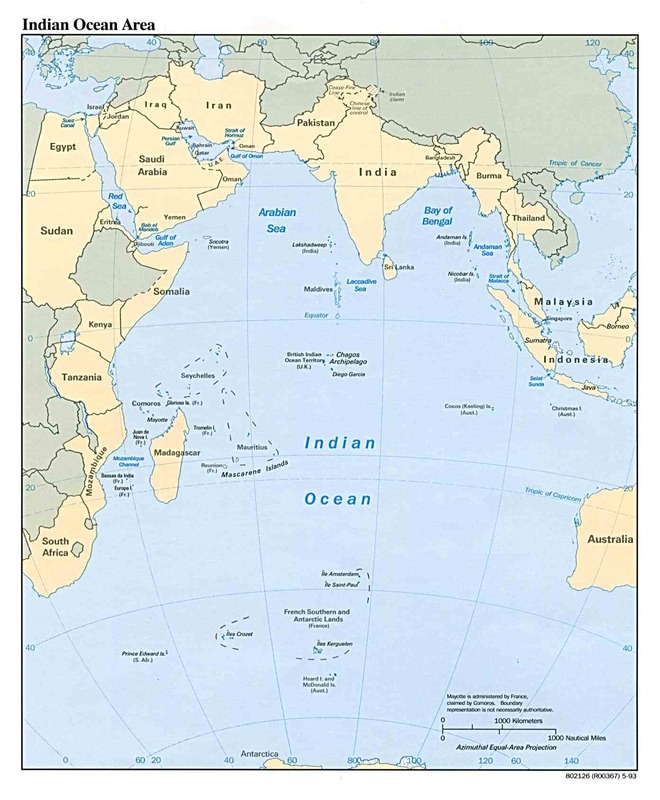 Make room now for the Indian Ocean. The key word in those quotes is “trade.” The Indian Ocean is the scene of a massive exchange of goods between nations and civilizations. The ocean that stretches from East Africa to the islands of Southeast Asia has a long history of trade, then five hundred years ago the West came in the guise of Portuguese, Dutch, French and English traders and navies. While trade is what ties the region together, religion plays a big part, as well. But while Islam is the dominant faith, it shares space with Hinduism and Buddhism, and the Islam of Southeast Asia is different from that in the Middle East. When I heard of John Kennedy’s assassination, I was sitting in the corner of my third grade classroom for some unremembered offense. When I heard the space shuttle Challenger had blown up, I was walking along the second floor hallway of the Administration Buiding at New Orleans Baptist Theological Seminary. When I heard about the 9/11 terrorist attacks I was visiting with Ken Camp at the Baptist Building in Dallas. Will hearing of the death of Osama bin Laden leave an equally edilible memory. If so, it will be the first one about which I cheered, at least for a while. I heard the news via a text message from my son, Landon, at 9:51 p.m. (Central time) while I was driving in the car to pick up my other son, Cameron. “We found bin laden and he is dead,” Landon wrote. Cameron arrived at the Shell service station in Eustace about this time. He had been to Frisco to see an FC Dallas soccer game with a group of youth from First Baptist Church in Athens. Shortly after he got in the car and we headed home, President Obama addressed the nation. Cameron and I listened quietly as Obama spoke. We arrived home and still sat in the car to listen until the president finished. My initial “hooray” had given way to something deeper. I hope we remember more than the news; I hope we remember the lessons learned. Today, I heard Mia Farrow speak at the international conference of the Public Relations Society of America. Amazing! She communicated with a mixture of facts and stories regarding the genocide in the Darfur region of Sudan. I knew, of course, about Darfur; but it had not been connecting with me. There was something about seeing this somewhat frail, western celebrity pouring her whole being into this situation that grabbed my heart and my mind.